MED-01-100 High Quality Stainless Steel VAS Rulers with Slider Indicator. Front has etched 0-10 cm analog scale. 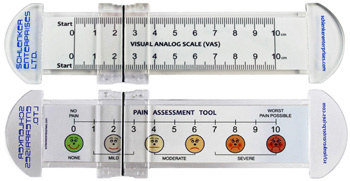 Reverse depicts faces numbered 1-5 where "1" stands for "No Pain" and "5" for "Extreme Pain"
MED-05-010 High Quality Plastic VAS Rulers with slider indicator made of combination of clear/white PVC, with double edge scale of 0-10 cm. 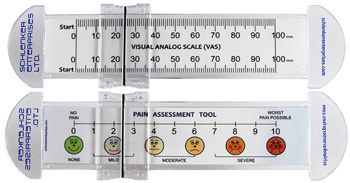 Reverse depicts faces numbered 1-10 where "0" stands for "No Pain" and "10" for "Worst Pain Possible"
MED-05-100 High Quality Plastic VAS Rulers made of combination of clear and white PVC, with slider indicator and double edge scale of 0-100 mm. W-RL-X-Ray-130 X-Ray (Radio Opaque) Precision Ruler 130 cm long by 38 mm wide,precisely engraved. Graduated in mm increments for accurate reading. W-RL-X-Ray-30 X-Ray (Radio Opaque) Precision Ruler 30 cm long by 38 mm wide,precisely engraved. Graduated in mm increments for accurate reading.